Eliminating energy poverty looms large among the 17 main goals that make up the UN’s strategic sustainable development agenda. Sub-Saharan Africa, where more people lack access to electrical power than any other major world region, is a focal point for associated efforts. Mini and microgrids are playing a growing role. More than 70 percent of Tanzanians lack access to electricity, according to a new report from the Tanzania Traditional Energy Development Organization and World Resources Institute (WRI). With a total generation capacity of 1,500 MW, Tanzania’s national power grid relies primarily on hydro power and natural gas to supply some 9 million Tanzanians with electricity. The report highlights lessons learned to date in development of Tanzania’s mini-grids, and elaborates on them to offer a list of policy, market and technology recommendations that could serve as a model throughout the region and beyond. “Given the challenges of insufficient electricity and difficulties for the national grid to reach all areas in the country, it is essential to develop mini-grids, microgrids and stand-alone electrification,” says Medard Kalemani, Tanzania’s deputy minister for energy and minerals in the report. The deputy minister’s statement notwithstanding, the report reveals that the vast bulk of Tanzania’s mini-grid power generation comes from diesel-fuel generators. That stands in stark contrast to neighboring Sub-Saharan countries, such as Kenya, Rwanda and Uganda, where a fast growing crop of social enterprise-sustainable energy startups are rolling out mobile pay-go solar PV home energy systems, as well as building out rural community and industrial microgrids. Multinational development agencies, wireless/mobile telecommunications providers, private investment groups and government are key development partners. Sixteen of Tanzania’s mini-grids are connected to the national grid. The remaining 93 operate independently of it, the report researchers found. As a result, independent mini-grid power output is delivered directly to customers, while grid-connected mini-grid owner/operators are selling power to the national utility, the Tanzania Electric Supply Company (TANESCO). Hydro is the most common energy source by number – 49 of Tanzania’s mini-grids rely on it for power generation. 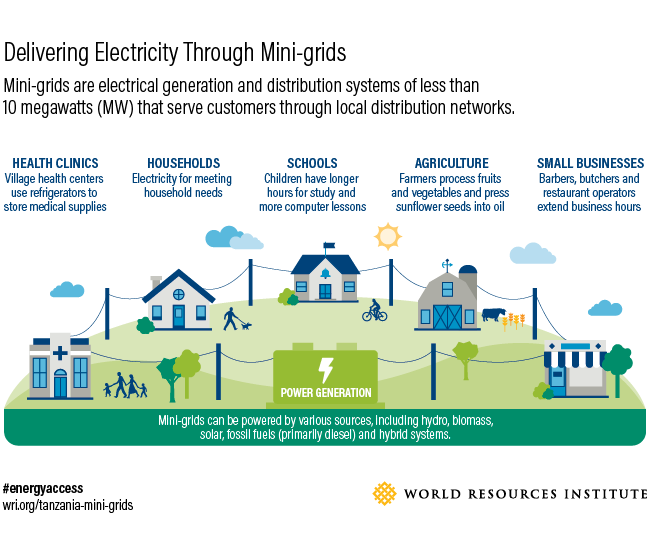 Though much fewer in number, the 19 registered fossil fuel mini-grids up and running across the country account for 93 percent of customer connections and nearly half of the national installed mini grid capacity, according to WRI’s report. In addition, 25 of Tanzania’s mini-grids rely on biomass as a generation fuel source. 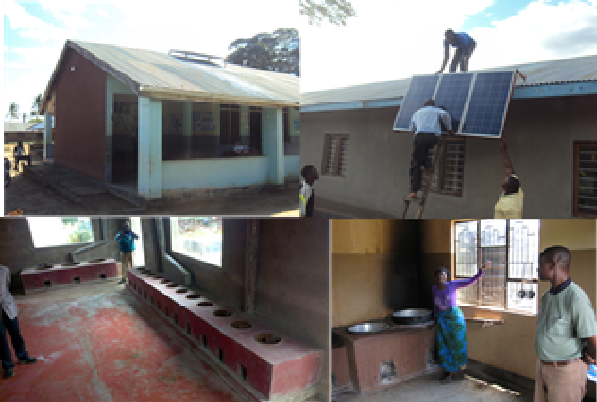 Thirteen are solar PV mini-grids, 10 of them funded by small donors as community-owned demonstration projects. In contrast, mini and microgrid development in neighboring Sub-Saharan countries has much more of an energy democratization aspect to it, with solar energy and battery-based energy storage playing a more prominent role. Also notable by way of contrast is the apparent lack of participation of wireless/mobile telecommunications companies in Tanzania’s mini-grid drive. Leading private Sub-Saharan African mobile telecoms companies, such as MTN and Orange, have played crucial, pioneering roles and are now expanding their investments and participation across the Sub-Saharan region’s fast growing solar-storage and mini/microgrid markets. A growing body of individuals and organizations see rapid growth in deployment of zero- or low-emissions mini/microgrids and distributed energy as seeds that may grow and develop further to create a new model of sustainable, environmentally friendly energy and socioeconomic development. 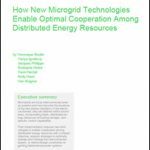 Microgrids for electrification have a global market potential of $400 billion, according to a recently issued study from Germany’s TFE Consulting, “Kenya: The World’s Microgrid Lab.” Looking ahead, TFE estimates that over the next five years the number of microgrids installed in Kenya alone will surge to between 2,000 to 3,000. Aiming to hasten realization of this potential, 10 industry stakeholder organizations from Kenya and Tanzania recently joined to create the Africa Mini-grid Developers Association. The association’s guiding mission is to help eradicate energy poverty in Africa, and to do so in a way that’s socially equitable and environmentally friendly, as well as economically sustainable. Sam Slaughter is a founding member of the newly formed Africa Mini-grid Developers Association. He’s also CEO of PowerGen Renewable Energy. In a recent interview with the non-profit Power for All, Slaughter contends that the time has come for mini-grids to take a big step up in scale throughout Africa. They’ll need more in the way of legitimacy to do so, however, he said. According to the Africa Mini-grid Developers Association, around 80 percent of the 600 million electricity connections needed across the region could come from private utilities, which are now approaching “critical mass” in terms of the scope and scale. The association’s strategic, Pan-Africa vision entails “leapfrogging” a generation of centralized, primarily fossil fuel, power generation and extensive transmission and distribution infrastructure by taking advantage of the latest in renewable energy and distributed energy resource management technology. 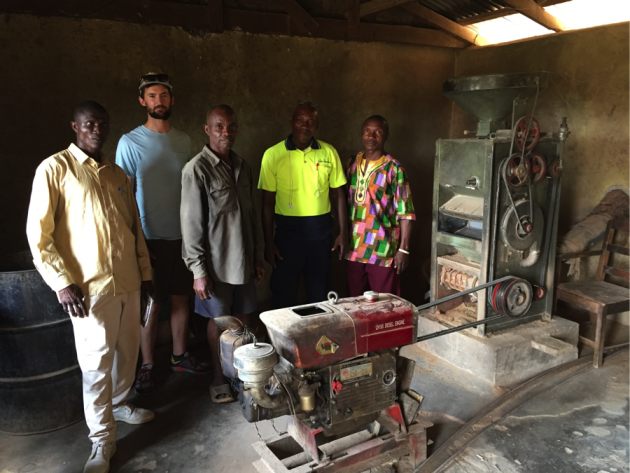 Track news about Tanzania’s mini-grids and other microgrid-related activities in Africa. Subscribe to the Microgrid Knowledge newsletter. It’s free.